That was the epithet for Ireland’s first foray into the Whitbread Round the World Race in 1989. 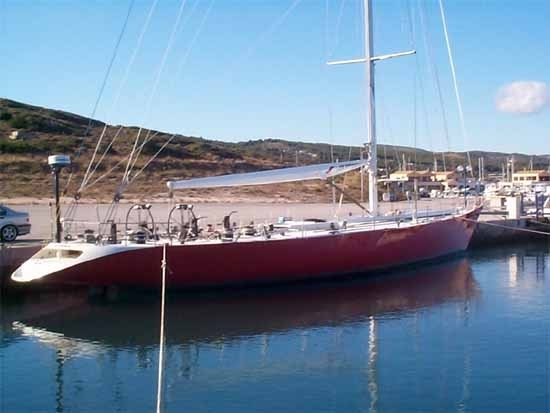 Now known as Athina and for sale in Barbados for $380,000. I took these pictures as the the boat was being moved from the Ballymun factory where it was built to the south side of the Liffey to be launched. 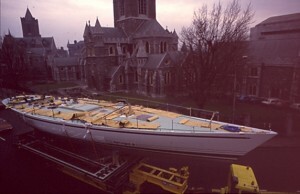 Passing Christ Church early on Sunday Morning, 30 November 1988. Getting wet on the South Quay, keel was considered to be “novel” and was covered from view. “THIS IS a boat that needs no apologies and no excuses. It can win the race,” the international sailing guru from Cork, Harold Cudmore, said at the launching yesterday of the 82-foot long, high-technology Maxi class racing yacht that will carry Irish hopes in the Whitbread Round the World Yacht Race next September. By the time it is race-ready, NCB Ireland, as the boat is rather unimaginatively named, will have cost £1.4 million to build and another £2.6 million will have been spent on incidentals, such as crewing and transport. National City Brokers, Aer Lingus, the ESB and Irish Distillers have dug deep into their corporate pockets for the money, but if the Irish boat can come home ahead of the other 38 entrants they will consider it well spent. 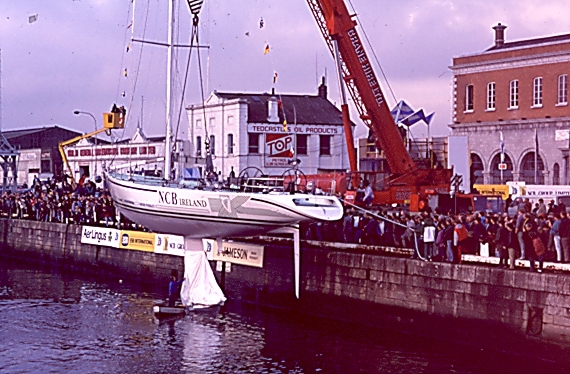 Everybody at yesterday’s launching, when NCB Ireland was lowered gently into the Liffey by crane, was full of confidence that Ireland could win. The Taoiseach, Mr Haughey, who officiated at the launching, said the yacht combined the very latest technology and some of the finest traditions in Irish shipbuilding. “We will follow her around the world with great hopes and great expectations,” he said. A well-known sailor himself, Mr Haughey was determined during his visit to the Liffeyside to talk about nothing but yachts, as some journalists who tried to press him on the Ryan extradition case quickly found out. The Government press secretary, Mr PJ Mara, stepped quickly between them and the Taoiseach with a threatening finger and curt, “don’t try it”. The interest of everyone else present, however, was fixed firmly on the huge boat. The keel was concealed by a great sheet of plastic so that the opposition could not get an inkling of its shape. Des Burke-Kennedy, a member of the group behind the venture, explained, “There’s shape under there that could be square, flat or fins – and it’s one of those”. Harold Cudmore, the team’s strategist, said that even very small differences between the boats in the race could make a big difference to their performance. The Irish boat is made from carbon and Kevlar and sports the latest navigational and weather forecasting equipment, courtesy of a Killybegs company, Barry Electronics, which normally deals with trawlers. NCB Ireland, however, will have its sights set not on herring or mackerel but on Portsmouth some time around the middle of 1990, and the greatest prize in the sport of sailing ever likely to come Ireland’s way. THE NCB Ireland was given a spectacular send-off from Dun Laoghaire pier yesterday, with a large turnout of the public and dignitaries and a remarkable display by all branches of the Armed Services. The yacht will carry the Irish colours for the first time in the Whitbread Round the World Yacht Race, which starts in Portsmouth on September 2nd. The Taoiseach, Mr Haughey, came by helicopter and landed on board the LE Eithne, which was moored in the harbour. He arrived in style by naval launch at the National Yacht Club, where he was greeted by Mr Howard Kilroy, chairman of the Sail Ireland Trust, and Mr Dermot Desmond, chairman of National City Brokers, the main sponsors. A large crowd of guests, including the crew of NCB Ireland, had been waiting for an hour and a half for the Taoiseach’s arrival, a wait made easy by the free bar and flowing conversation. Mr Haughey, accompanied by Commodore WJ Brett and Lt Commander C Lawn, walked to the East Pier where local clergymen officially blessed the boat at a ecumenical service, and Mr Haughey made a speech praising the initiative and craftsmanship which had gone into the sleek vessel. “Remember Mizen, lads,” shouted some wag to the launch crew as Mr Haughey boarded the small vessel to be taken aboard the Eithne again. This seemed to spark some devilment in the Taoiseach, who spotted this man from The Irish Times on a boat carrying some actor/pirates who were exhorting the public to throw Mr Haughey into the sea. For a few minutes it looked as if they were going to obey the man called the Boss. A huge flotilla of boats then joined the NCB Ireland as she hoisted sail and headed for the open sea. At the mouth of the harbour a 13-gun salute was fired from guns located at the end of the East Pier. As the vessels left the harbour, a replica of the first Aer Lingus aircraft, the Iolar, flew past, and within minutes the Air Corps performed its fly past of the day, its Dauphin helicopter making a low pass over the flotilla and the Eithne. It was later to drop a parting gift of a crate of champagne to the NCB Ireland crew, which had also been presented with a gift by the Taoiseach, Mr Haughey. Suddenly, the weather outside the harbour turned nasty and, delighting in the freshening wind, the skipper of NCB, Joe English, ordered more sail to be hoisted. The yacht seemed to jump out of the water and within minutes the flotilla was falling far behind. That is the kind of performance we will all be looking for when NCB Ireland hoists sail in Portsmouth and starts off on the 32,000-mile race which will last for nine months.